Party Fun Pirate is based on the popular Pop-Up Pirate toy, players take turns thrusting swords into a barrel that holds your captain captive, trying to see who can insert the most swords into the barrel. Thrust a sword into the wrong hole and you'll send your captain flying, which means it's game over for you! 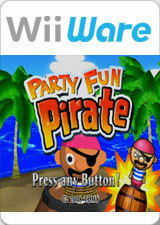 Unique Wii features add to the excitement, making for a fun-filled party game. Try swapping out the captain and putting your custom Mii character in the barrel for some real laughs! The graph below charts the compatibility with Party Fun Pirate since Dolphin's 2.0 release, listing revisions only where a compatibility change occurred. This page was last edited on 22 January 2018, at 03:23.